The majestic tree that fell two weeks ago was believed to have altered the Toa Payoh's shophouse layout in the 1960s. 1.The God Tree is a landmark located in the heart of Toa Payoh Central. It is a ficus, also referred to as a banyan tree, with characteristic leafy canopy and hanging branches. Believers regard the tree as a ”shen shu” – or ”god tree” in Mandarin. It is also known as Tree Shrine or Tree Temple. 2. It is believed to be more than 100 years old. It was approximately six storeys tall. 3. The tree collapsed on Sept. 11 this year at around 2 p.m. during a storm. 4. Residents in Toa Payoh, who were interviewed by the media, said they consider the felling of the tree to be a blessing. According to at least one eye witness, the tree “chose” a direction to fall, and crushed several cars but injured no one. 5. And according to residents, segments of the tree had previously fallen before, but was otherwise left intact. 6. Urban legend has it that when work began to develop Toa Payoh New Town in 1965, the bulldozers sent to flatten the area allegedly malfunctioned when they approached the tree. The bulldozers could only move in reverse, but not forward towards the tree. There were others who tried to fell the tree, but they too ended up with the same fate. 8. Religious leaders offered prayers to the tree but it “refused” to budge. The authorities then decided to leave the tree alone. Residents believe the government took the tree into consideration when planning Toa Payoh town’s layout. The initial plan to build a long row of shophouses was abandoned. Instead, the government split the development in two to accommodate the ficus. 9. 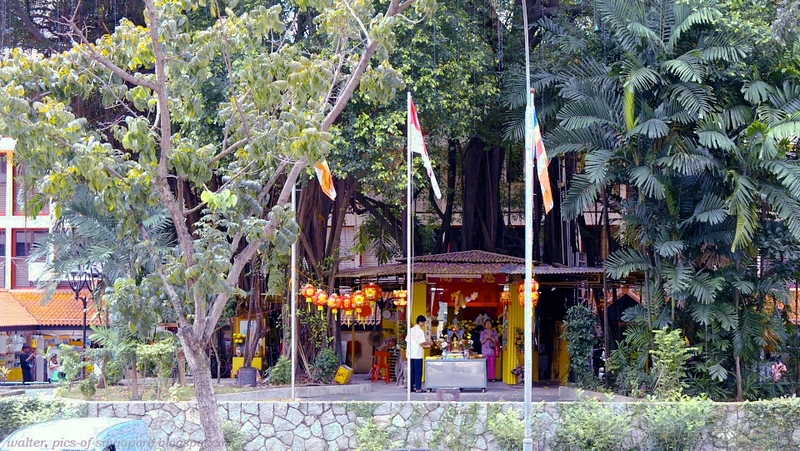 The tree’s shrine, which sheltered a Goddess of Mercy statue and a four-faced Buddha and known as Ci Ern Ge, was added soon after the town was built. The original caretaker was a monk who brought the statue of Goddess of Mercy Guan Yin from China. He had a habit of sleeping under the tree. When the monk died of a heart attack in 1975, his son, now 53, took over and has also stayed on-site. Now that the tree has fallen, he believes his promise to his father has been fulfilled and he will be returning to his hometown in Malaysia. 10. The Toa Payoh Central Merchants’ Association hopes to restore the shrine by Chinese New Year next year. The tree will be trimmed to a shorter, more manageable height, to be slightly taller than the shrine.